Click the account from which you want to send the e-mail. It’s in the upper right corner with the + symbol. 3Type the e-mail address of the recipient(s) in the To field. If you want to send a courtesy copy of the message to other people enter addresses in the Cc field, or to send a blind copy, click the Show More link and enter an address(es) in the Bcc field. You can also choose a priority for the message by clicking the Priority field and making your selection. 4Click in the Add a Subject field and type a concise yet descriptive subject. This is the field at the top on the right. 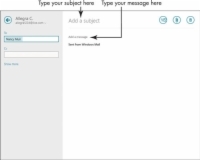 5Click in the message pane beneath the subject and type your message. Don’t press Enter at the end of a line when typing a message. Mail and most e-mail programs have an automatic text-wrap feature that does this for you. Do be concise. If you have lots to say, consider sending a letter by snail mail or overnight delivery. Most people tire of reading text onscreen after a short while. Keep e-mail etiquette in mind as you type. For example, don’t type in ALL CAPITAL LETTERS. This is called shouting, which is considered rude. Do be polite even if you’re really, really angry. Your message could be forwarded to just about anybody, just about anywhere, and you don’t want to get a reputation as a hothead. 6When you finish typing your message, click the Send button. The message is on its way! 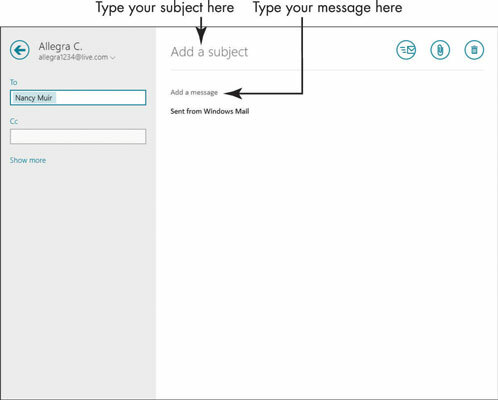 Remember that when you’re creating an e-mail, you can address it using a stored address in the People app. Click the To, CC, or BCC link in the address area and the People app appears. You can then select a contact(s) from there and click the Add button. Mail also allows you to just begin to type a stored contact in an address field (To, Bcc, or Cc), and it provides a list of likely options as you type. Just click the correct name when it appears in the list to enter it.